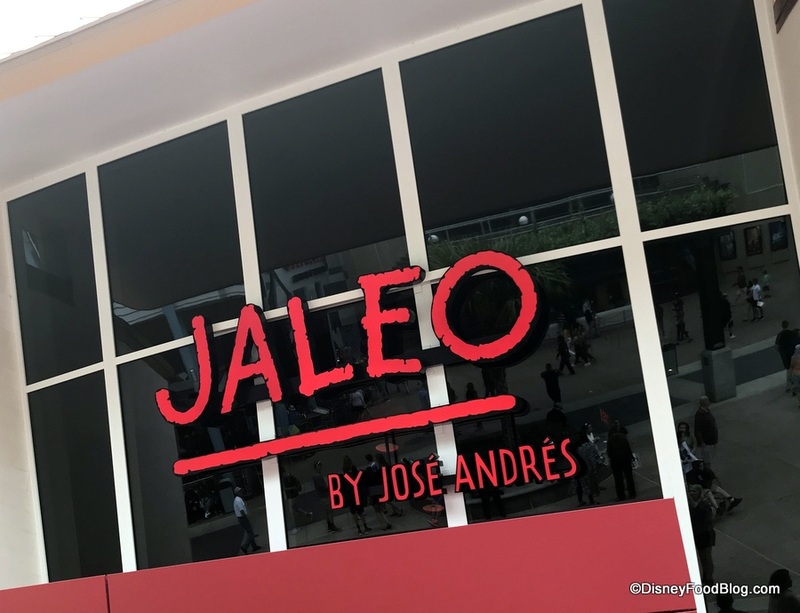 The Disney Springs location presents the biggest Jaleo yet. 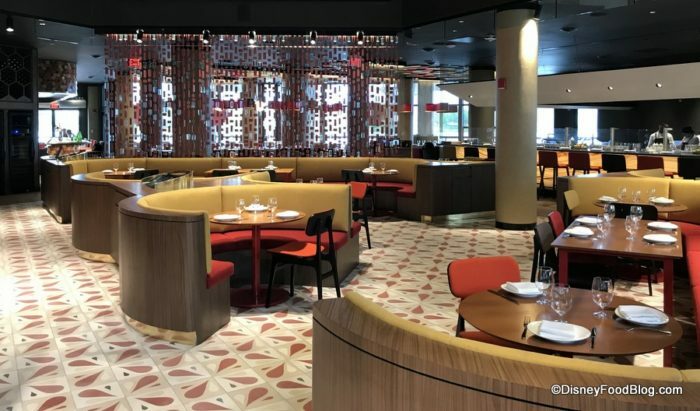 Aside from the sheer size of the multi-level restaurant, the other striking aspect are the red, orange, and gold “citrus-inspired hues” you see decorating the space upon setting foot inside. 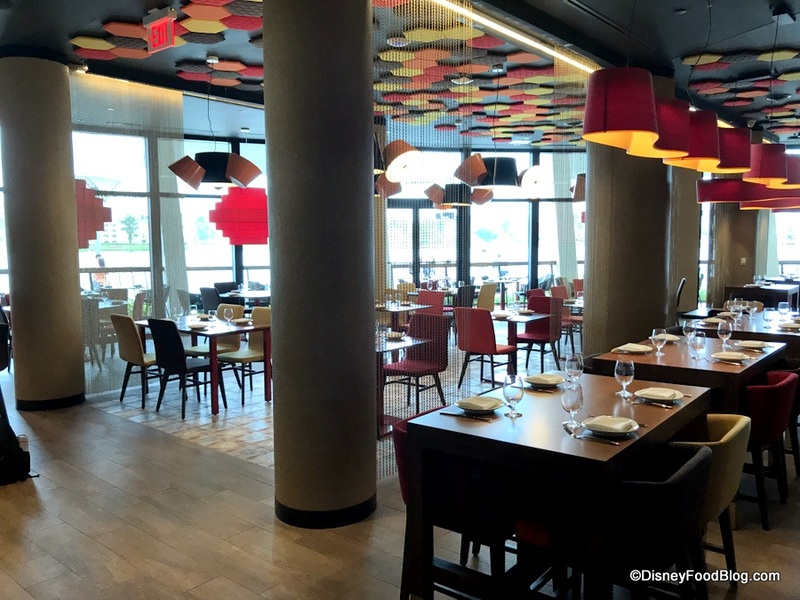 Even with the vivid color scheme, the space still feels bright and open with light colored wood tabletops and clean lines. But there are also some decorative elements that are just plain fun surrounding the mixed booth and chair seating. I have read the word “vibrant” used to describe Jaleo, and it certainly applies! The setting manages to be both upscale and whimsical at the same time. 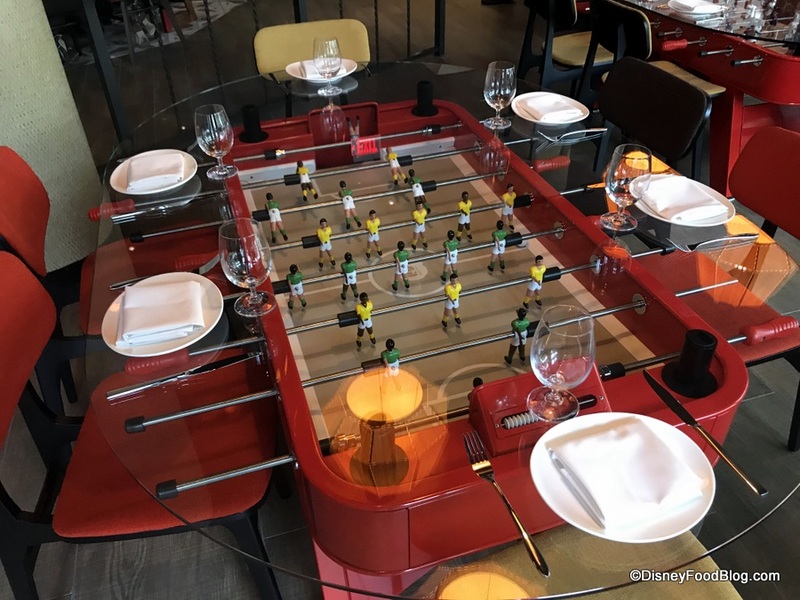 I mean, who would NOT want to sit at the Foosball Table?! Other unique features include onstage kitchens. 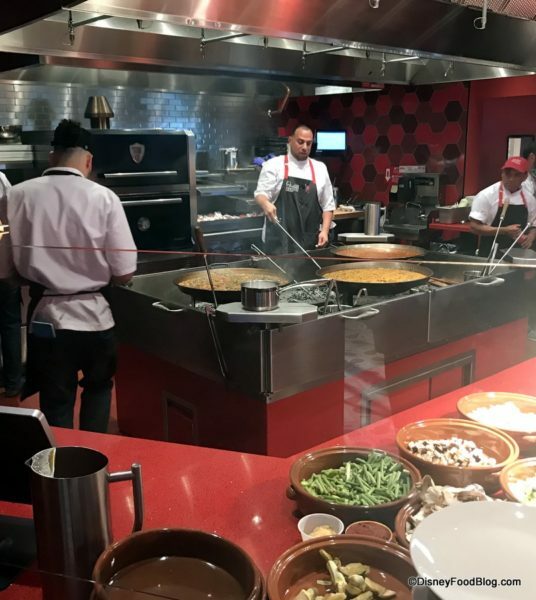 Most notable is the huge wood fire paella pit for preparing the authentic paellas! They will prepare two paellas every night here — one vegetarian and one meat. 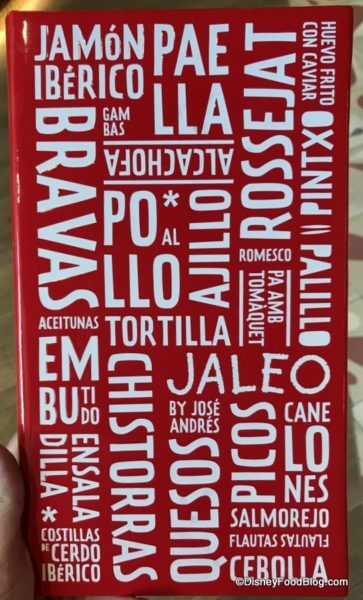 The choices will rotate, but just a note that the restaurant has been best known for the classic Valencia Paella. A special Opening Night cutting board was even on display at the paella pit for the big day! Bar seating is also available for guests in a few areas. The upstairs space features, among other things, the Jaleo Academy. This space has eleven seats and in the future may be booked for demonstrations, wine or sherry pairings and the like! 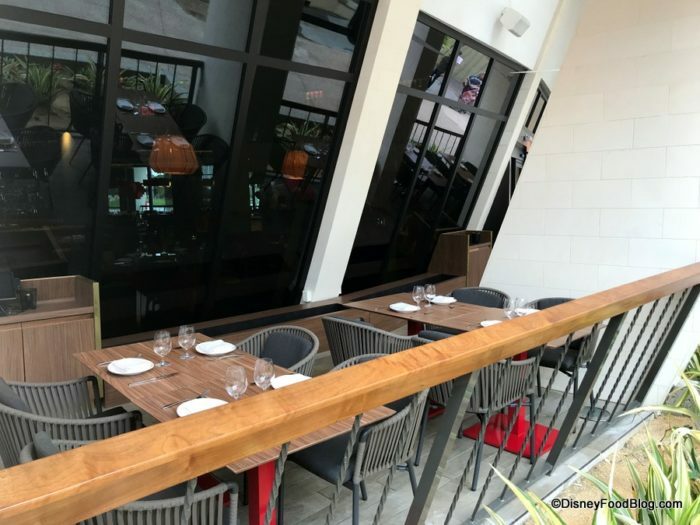 And there is a fairly large area of outdoor patio seating as well. 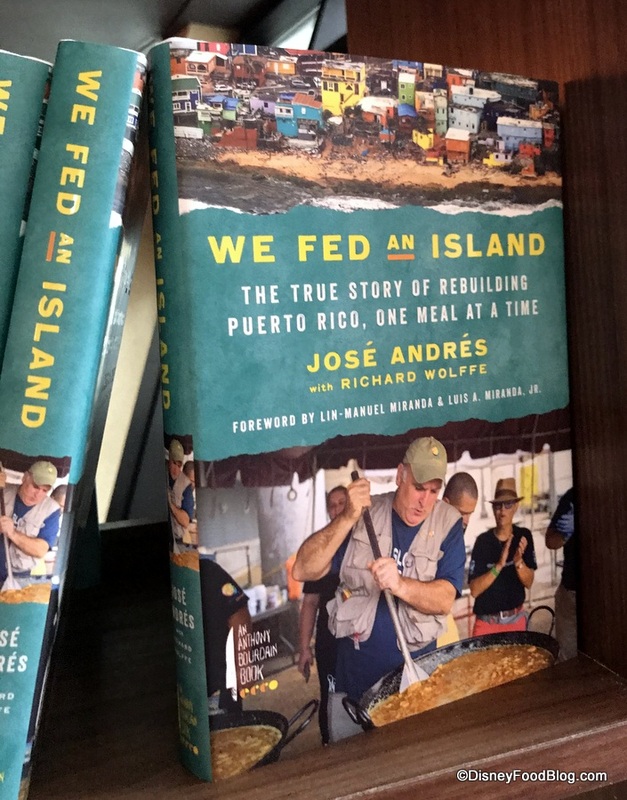 And you can even pick up “We Fed An Island,” written by the Chef himself. 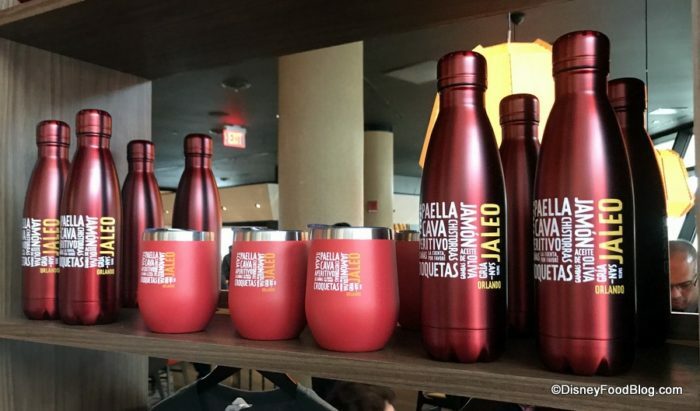 But, of course, we can’t forget drinks to start! The Salt Air Margarita is MiLagro Blanco tequila and Combier L’Original with lime and salt air. 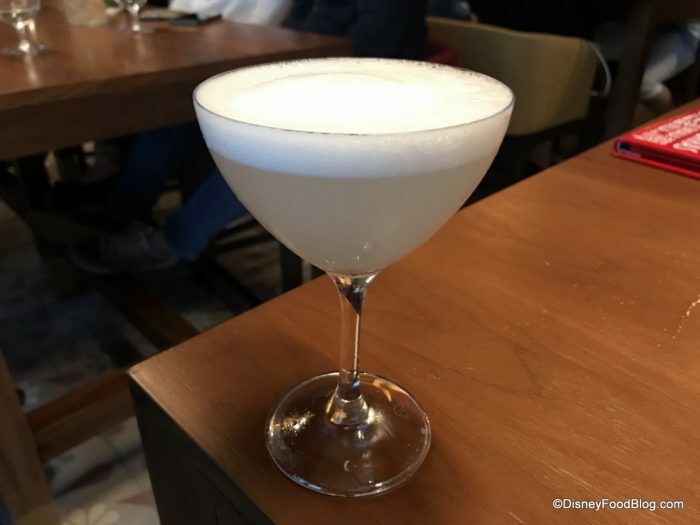 The “salt air” means that it’s topped with a salty foam as opposed to a traditional salt rim. And let me tell you… it’s seriously salty! 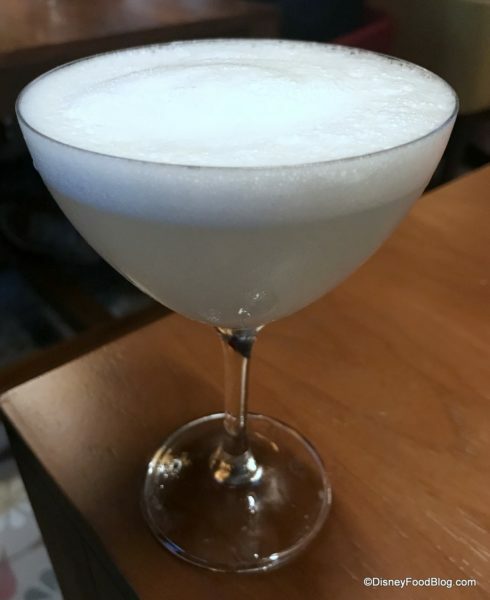 Sipped on its own, the foam is too intense, but the drink comes together well when it’s sipped together with the margarita. 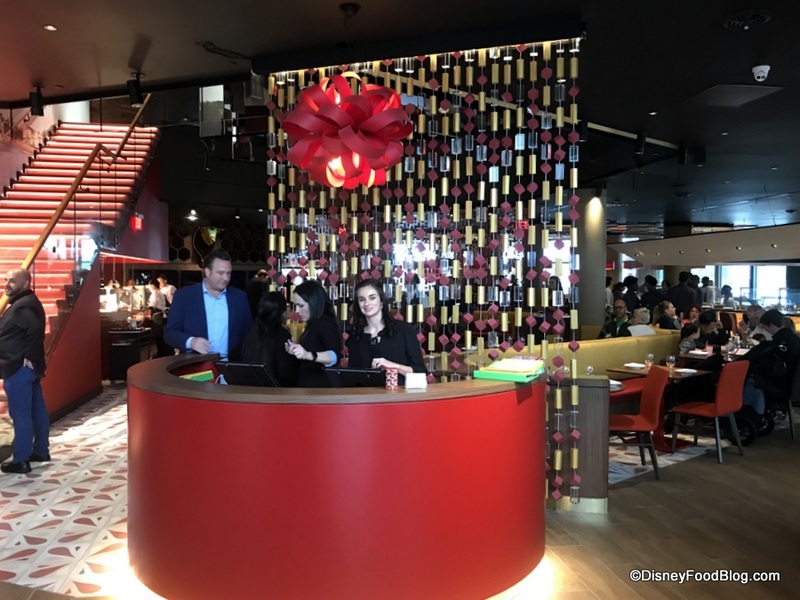 The lovely Cuvee Jose sparkling wine is only available at Jaleo in Disney Springs! 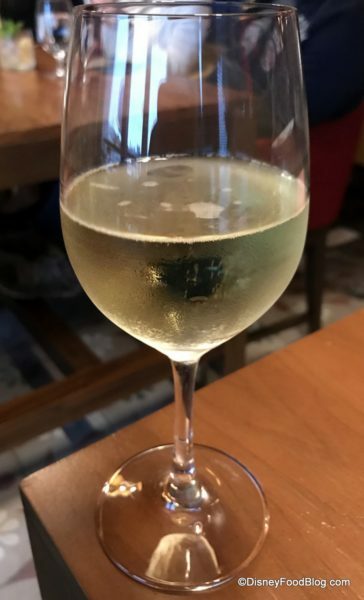 It’s a dry wine, and really enjoyable. Moving onto the food, each item comes out as it is ready. 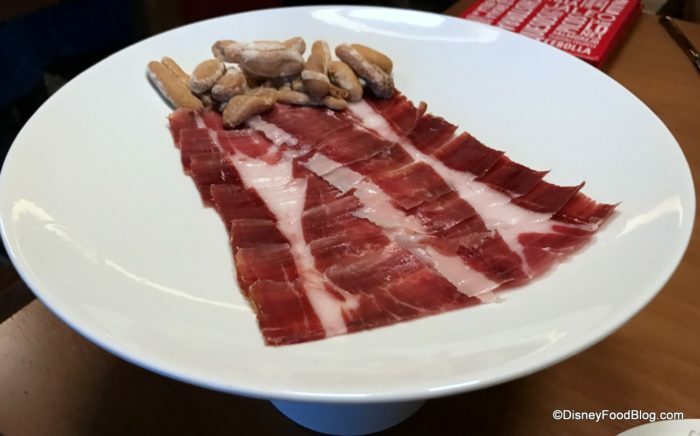 We’re starting here with the Jamon Iberico de Bellota Cortado a Mano which presents a serving of 36 to 48-month cured ham from the free range ibcerco pigs of Spain. 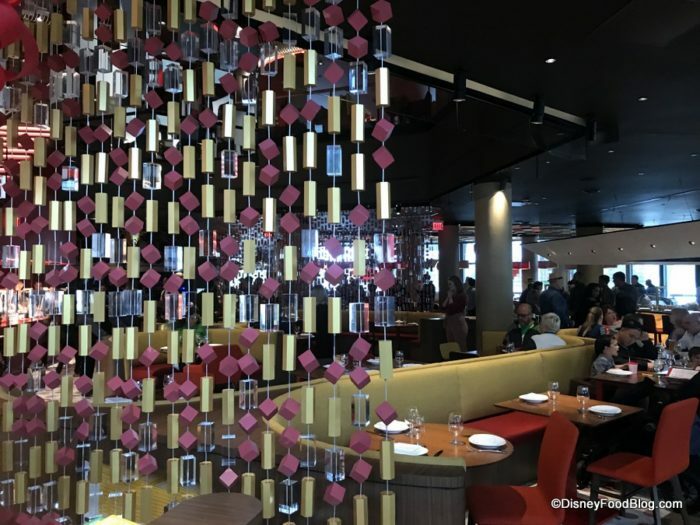 It is hand-carved and served tableside by a server who took classes in carving the meat and plating the dish. Served with small pieces of crunchy bread, this is simply delectable. It’s not overly salty and the fats melts away, unlike a prosciutto. 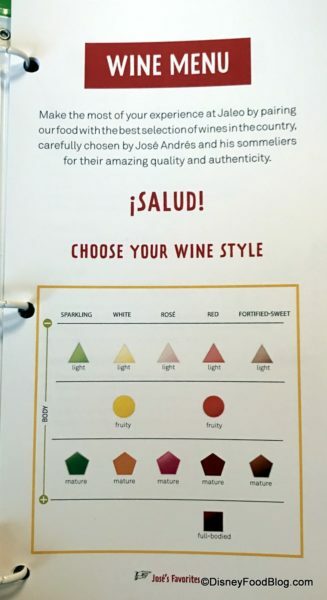 It’s recommended, by the way, that you pair it with cheeses. 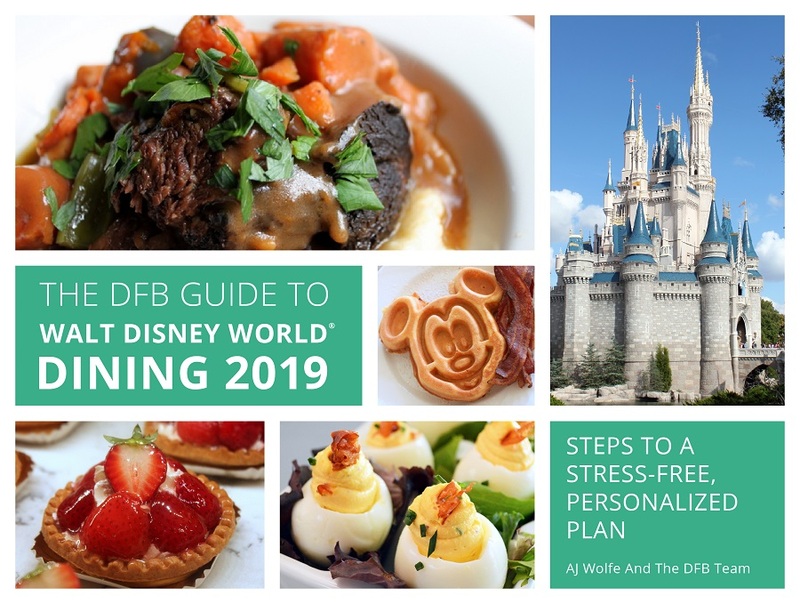 And when have you ever known the DFB to go without a cheese plate? 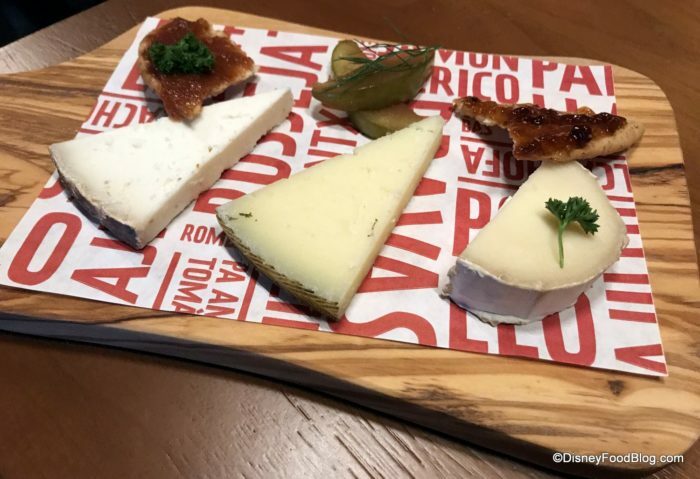 For the Quesos, you can choose a selection of three or five cheeses. 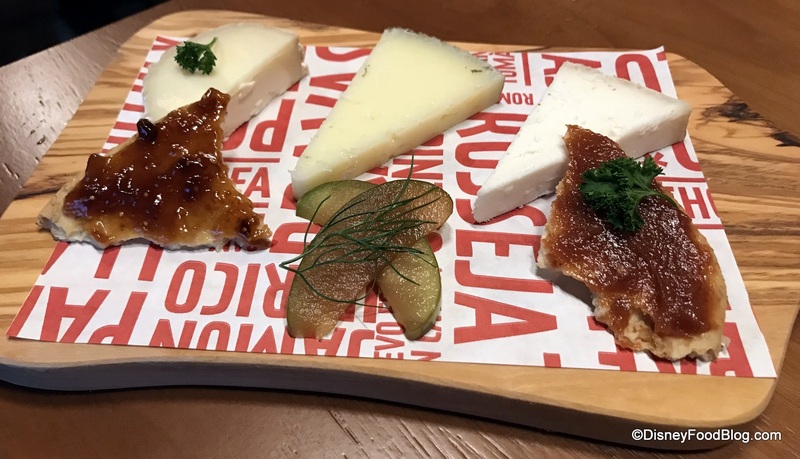 Our choice of three included Payoyo (a creamy goat’s milk cheese) with Marcona almonds, Machengo with apples, and Queso Massimo (an Asturian raw cow’s milk cheese “made exclusively for Chef José Andrés and Jaleo”). The Queso Massimo, in particular, is super soft and creamy, and was the favorite at our table. The Manchego offers a nice nutty taste that pairs well with the apples. The Payoyo was the strongest of the three, yet not overwhelming. 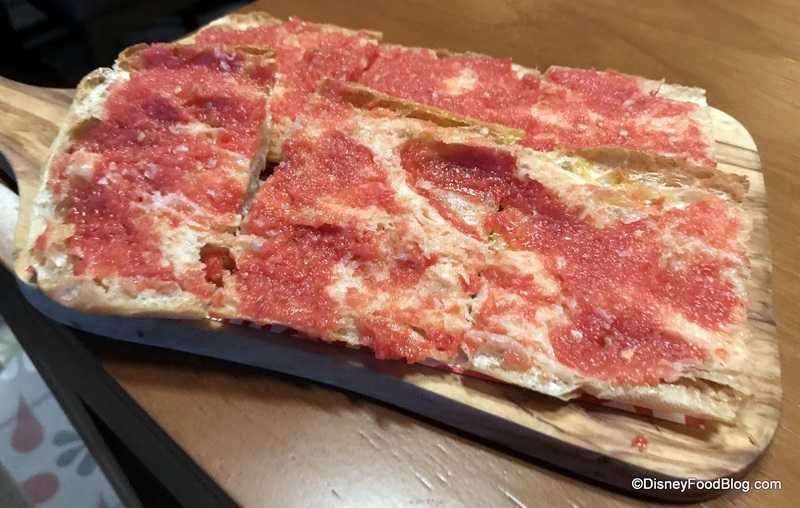 Pan de Cristal con Tomate takes the Spanish crispy bread and brushes it with fresh tomato. It presents so much flavor for something so simple! 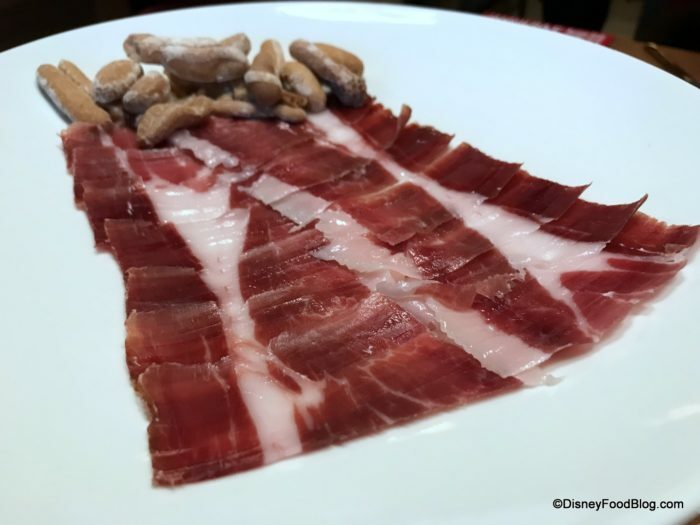 You can also mix and match and top with the ham or your cheeses. 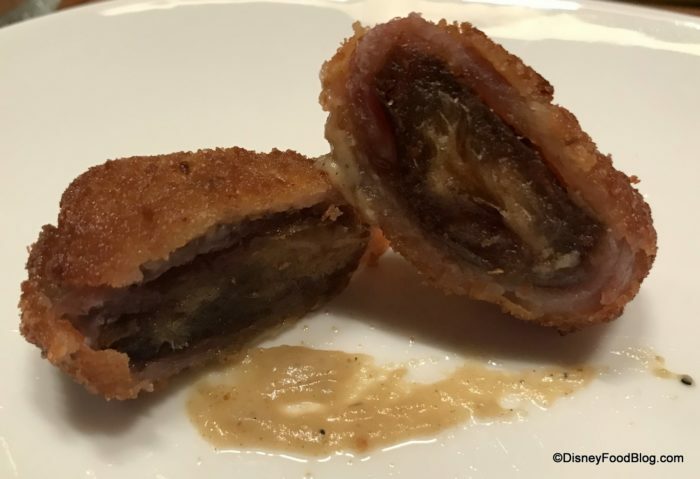 The Aceitunas Modernas y Clasicas presents ‘Ferran Adria” liquid olives and gordal olives from Spain stuffed with piquillo pepper and anchovy. Our server recommended it as an especially interesting option. The olives are prepared with “molecular gastronomy” and you’re advised to pop the whole olive in your mouth, then press it against the roof of your mouth and it will explode! Fans of olives really should put this on their must-try list. 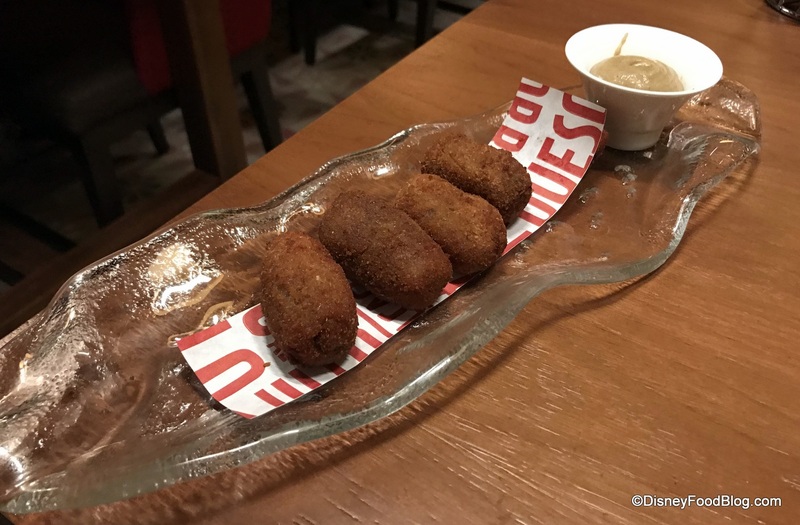 The Croquetas de Pollo are traditional chicken fritters. But the presentation is anything but traditional! 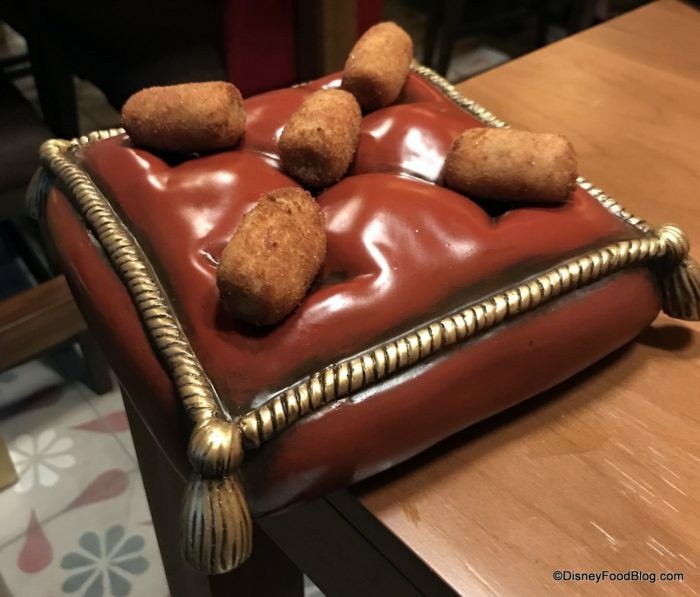 Chef Andres had a special plate made to resemble the pillow which held Cinderella’s glass slipper. Even better, the chicken fritters themselves were one of the best things we ate all night. 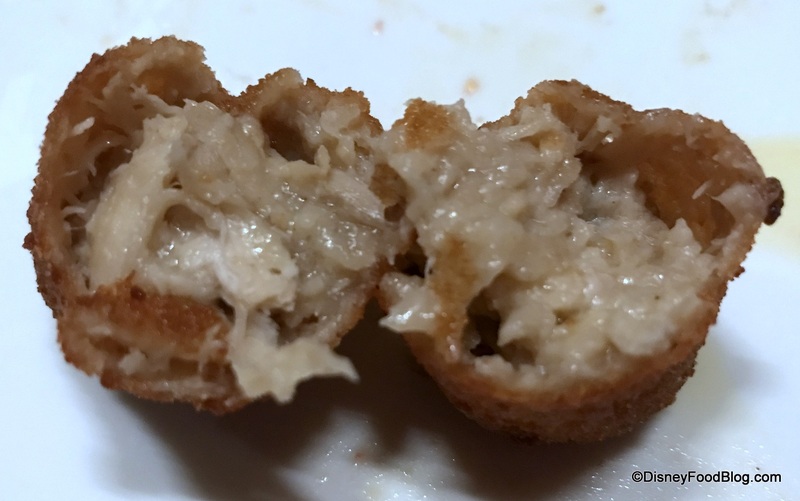 The light crust (almost like a hush puppy) surrounds a flavorful center featuring shredded chicken and a creamy béchamel sauce that is cooked for TWO days! The recipe comes by way of the Chef’s mother. 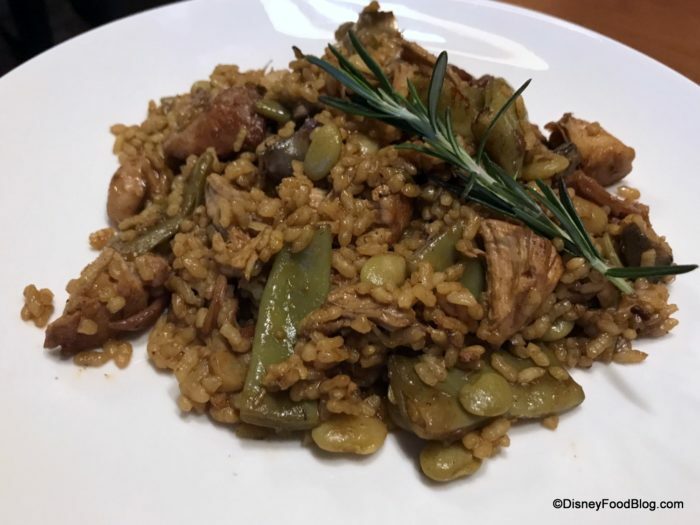 Ours was the classic Valencia Paella: chicken, rabbit, lima and green beans and the seasonal veggie of artichoke. And it’s fabulous. 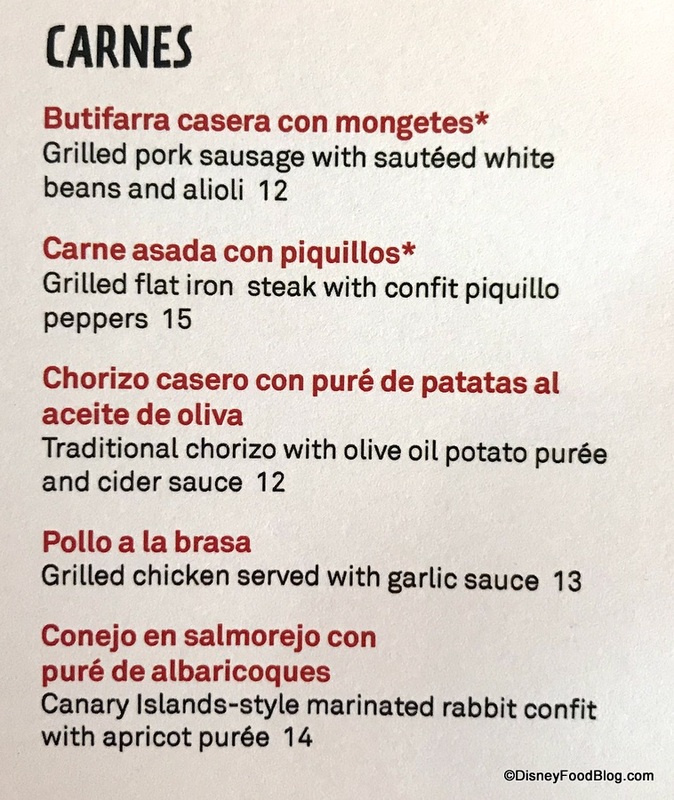 The rabbit is gamey in that it’s chewier than the chicken, but still not tough. And the entire dish is bursting with flavor from the terrific seasonings, too, with lots of rosemary and saffron. 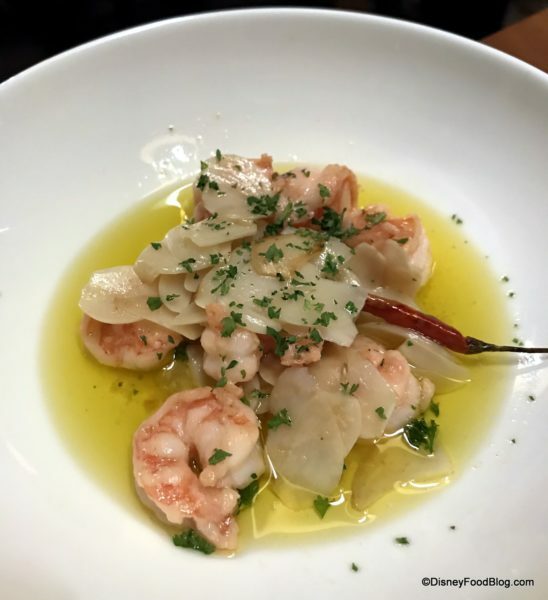 The Gambas al Ajillo is the “very, very famous tapa” of plump shrimp sautéed with garlic. 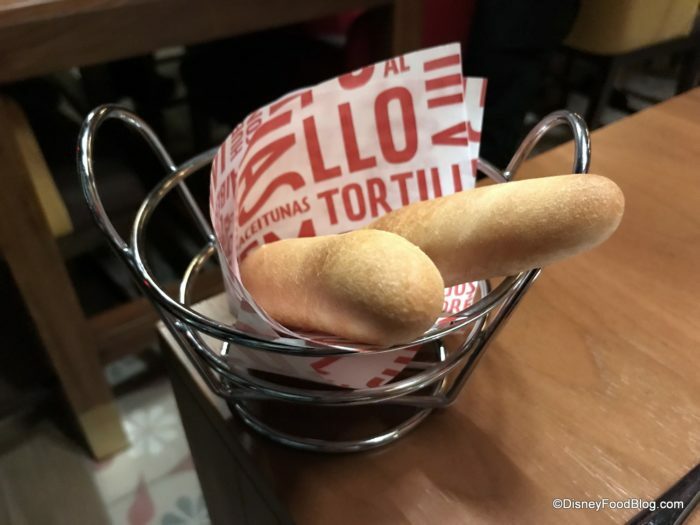 It’s served with Flauta bread to dip into the garlic olive oil sauce. And last — but not least — of our tapas are the highly recommended traditional bacon-wrapped dates, Datiles cob Tocino. The bacon comes through nice and strong against the sweet dates. Ok, when I said “last,” you didn’t think we’d forget dessert, did you? 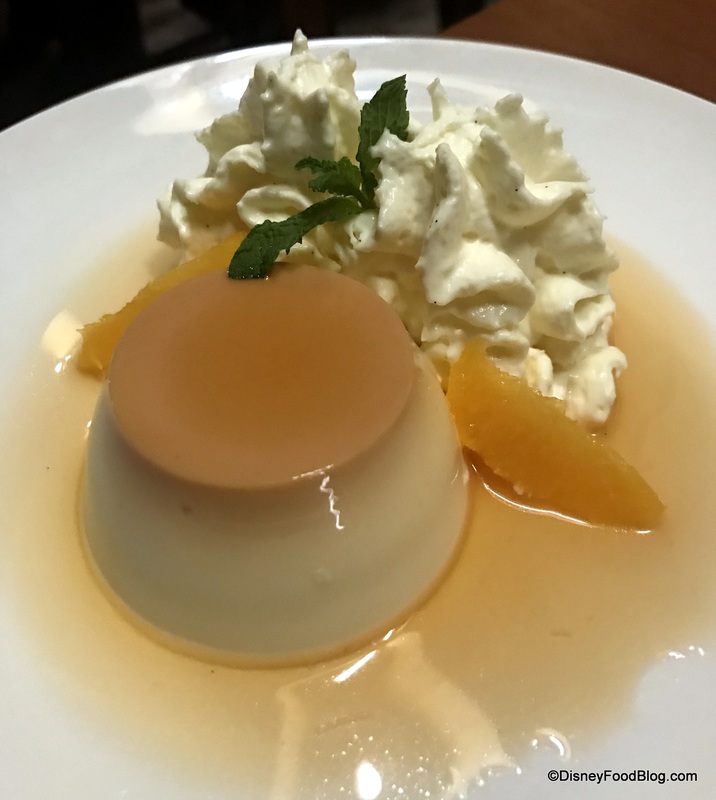 We went with two recommendations: the Flan and the Olive Oil Ice Cream. 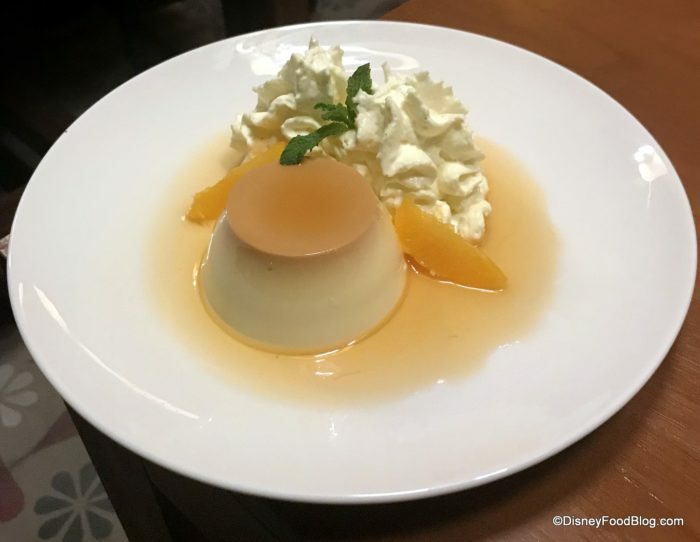 The Flan is the classic Spanish custard with “espuma” of Cantain cream and oranges. 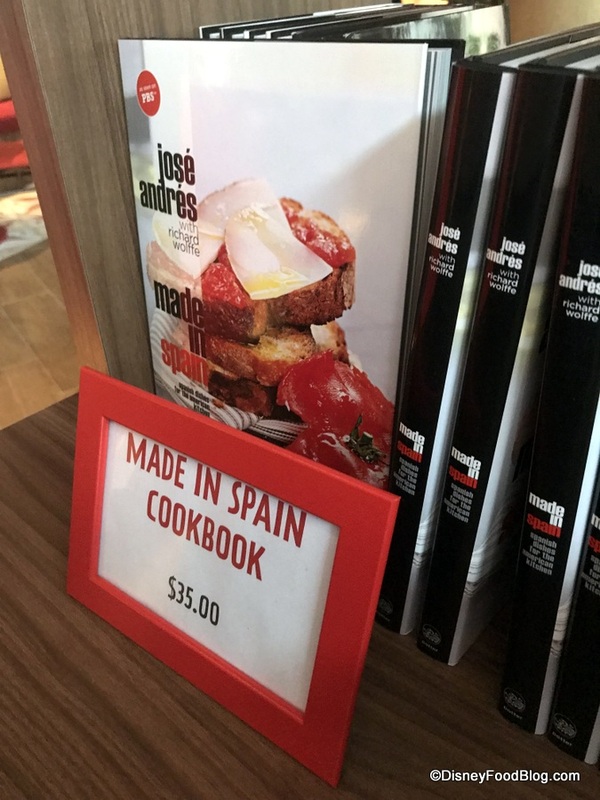 It’s the recipe of Chef Andres’ grandmother. The whipped cream has hints of cinnamon and citrus, and the flan is so creamy, yet not super heavy after a big dinner. 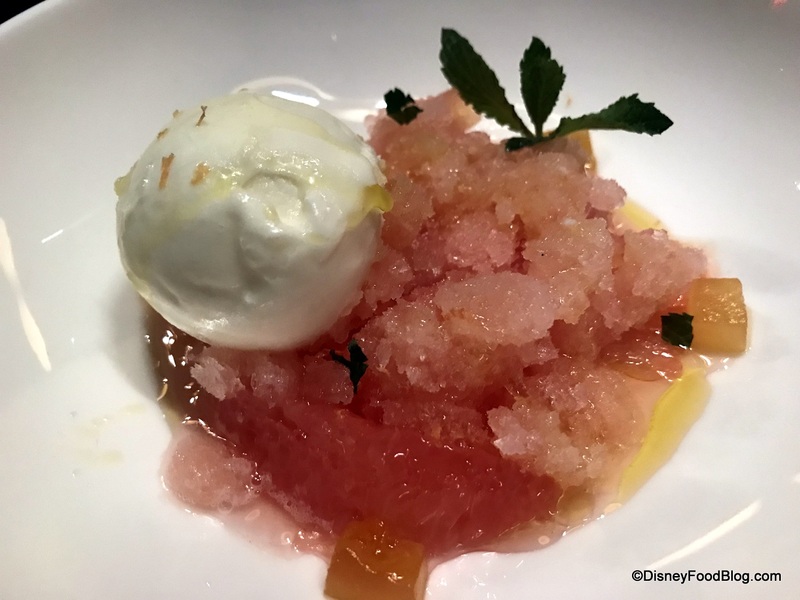 The Citrocos con helado de scite de oliva is Olive Oil Ice Cream with grapefruit. 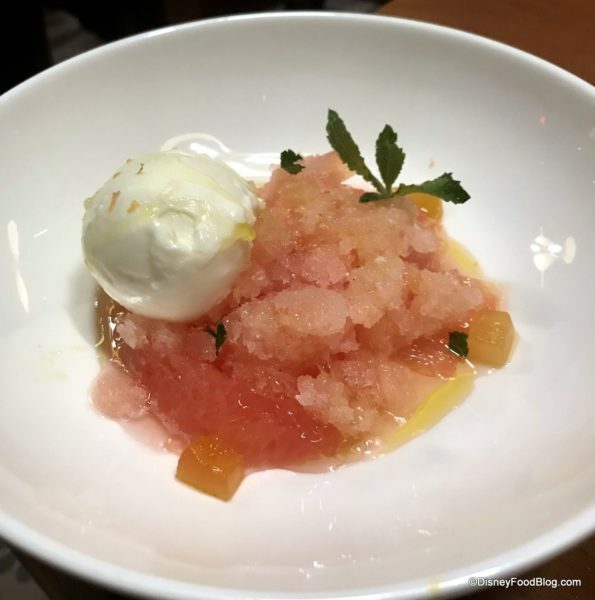 You definitely need to enjoy grapefruit because the dessert has chilled grapefruit chunks and even grapefruit candy. 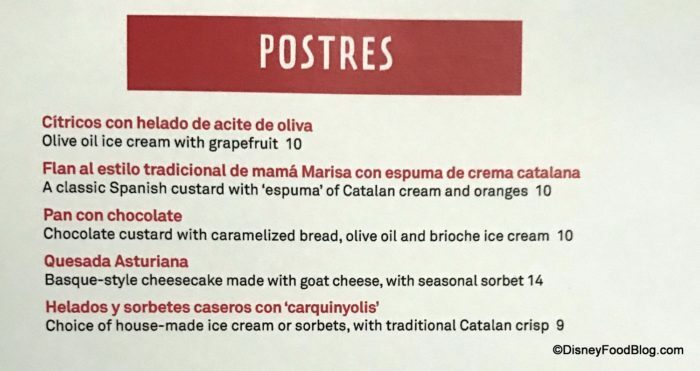 The olive oil is both in the ice cream and drizzled on top. It’s not something I typically would have ordered, but it’s very unique and quite good! And with that we’ve enjoyed our first, but not last, evening at Jaleo! Our first visit to Jaleo was — quite simply — a wonderful experience. We enjoyed great service in a beautiful setting. And due to the huge variety in the tapas-style dining, and Jaleo’s menu in particular, there’s something sure to satisfy just about every guest from the pickiest to the most adventurous eaters. Better yet, it’s delicious, with every item we tried packed with flavor. 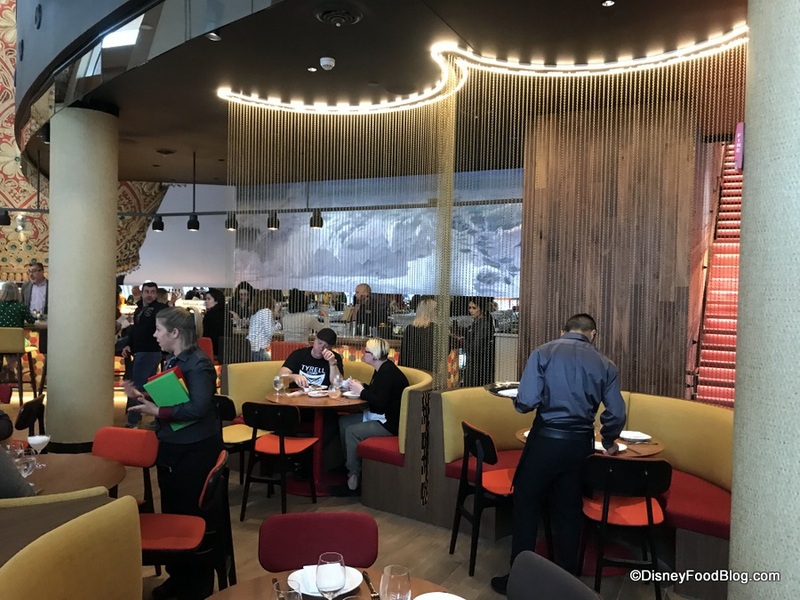 Jaleo, as it turns out, was very much worth the wait, and we’re glad it’s in Disney Springs at last! Some logistics: in its opening phase, Jaleo is open for dinner beginning at 5:00 PM. 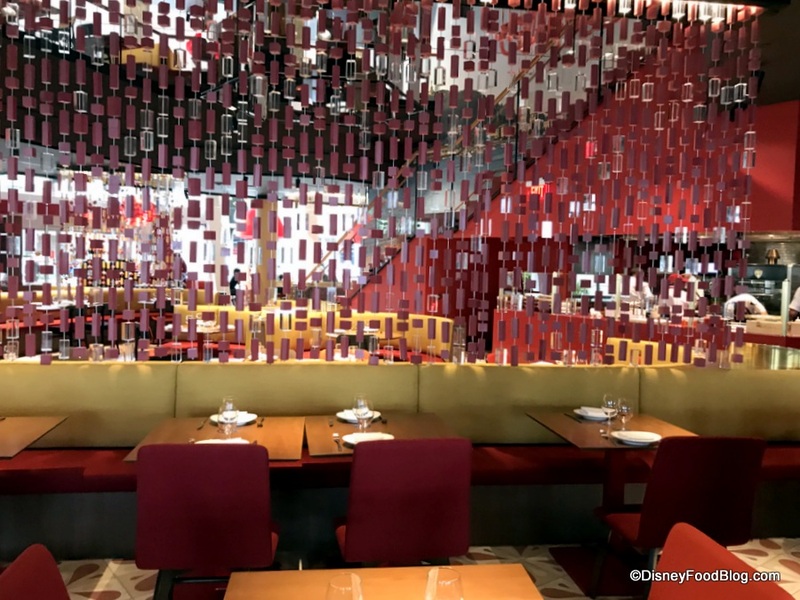 However, later this month lunch service will start daily as well. 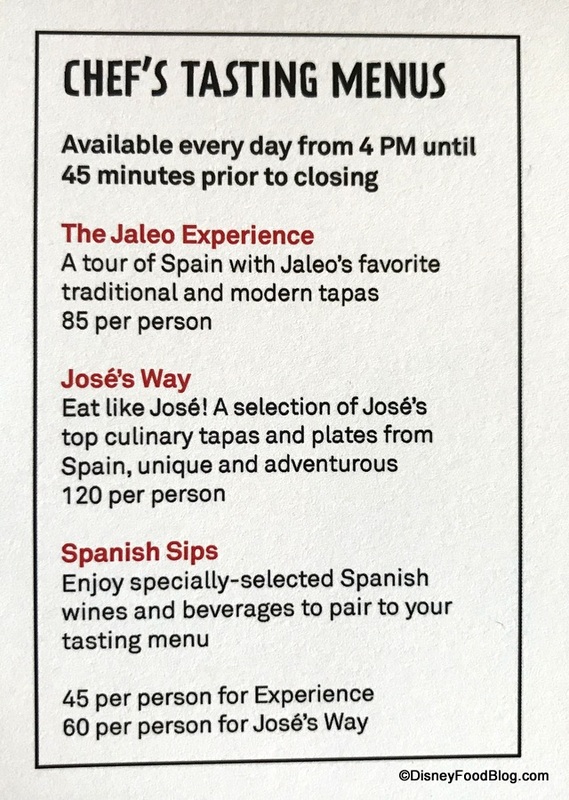 Guests participating on the Disney Dining Plan will want to know that Jaleo is a signature location requiring two table service credits. Reservations were not available for this evening, but interested guests may soon call for reservations at (321) 348-3211 or visit OpenTable.com, and reservations will also soon be available through the Disney World website or by calling (407) WDW-DINE. 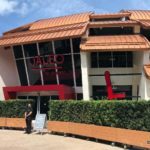 Will you be dining at Jaleo? Please let us know with a comment! « New Crêperie Announced For Epcot’s France Pavilion! Great review!! I’ve been waiting for this restaurant to open for a while and am so excited to try it after your review. Debating now if I want to visit twice during my visit, lol! I’m very interested to know how the dining plan would work for this restaurant. 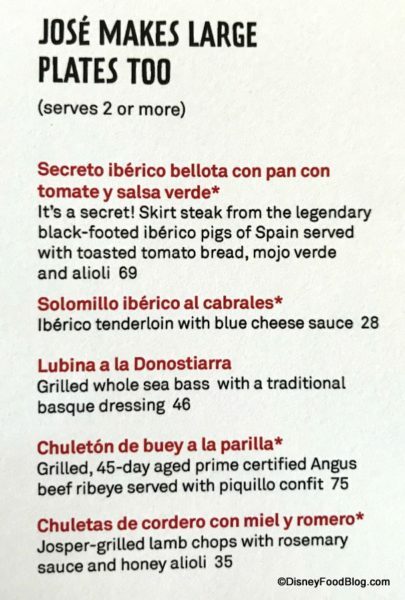 A lot of the menu items are tapas, which would not be enough as an entree. A little disappointed (maybe a lot disappointed) in a restaurant that I have been waiting for. 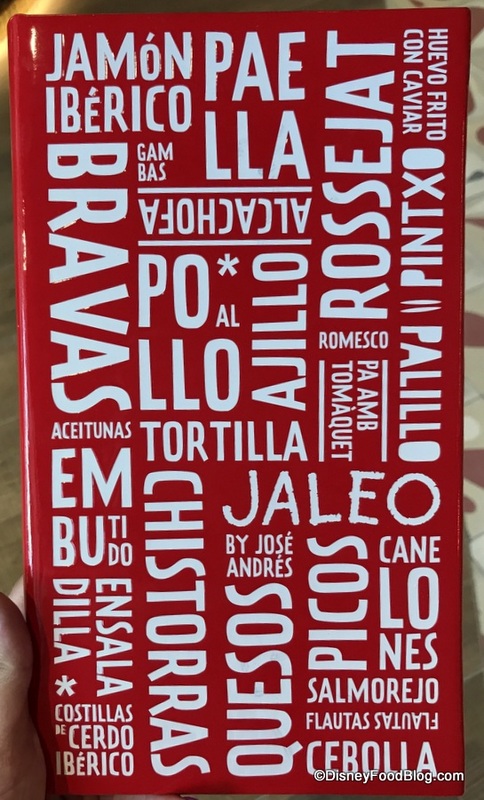 First, the person wiring the menus needs to have their thesaurus taken away and someone else needs to rewrite. What is ‘ethereal’ bread? 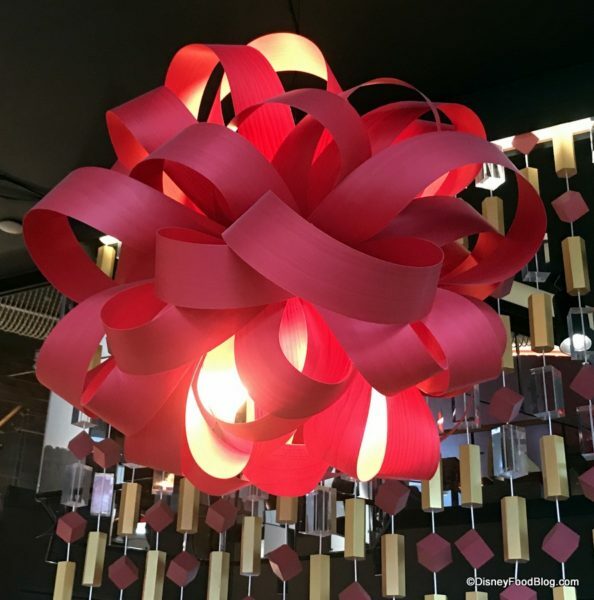 maybe light? Maybe airy? But I have no idea what that means. 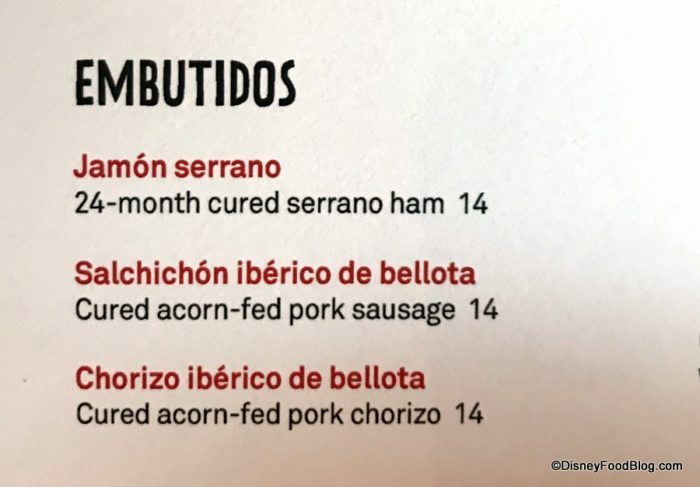 There are at least three menu items that are described as ham. 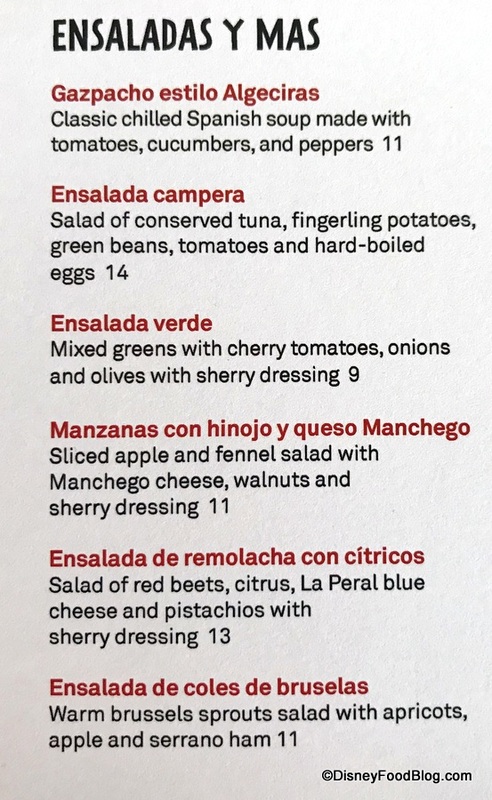 I mean, I get tapas and have been to Spain, but not everyone is going to see the difference. 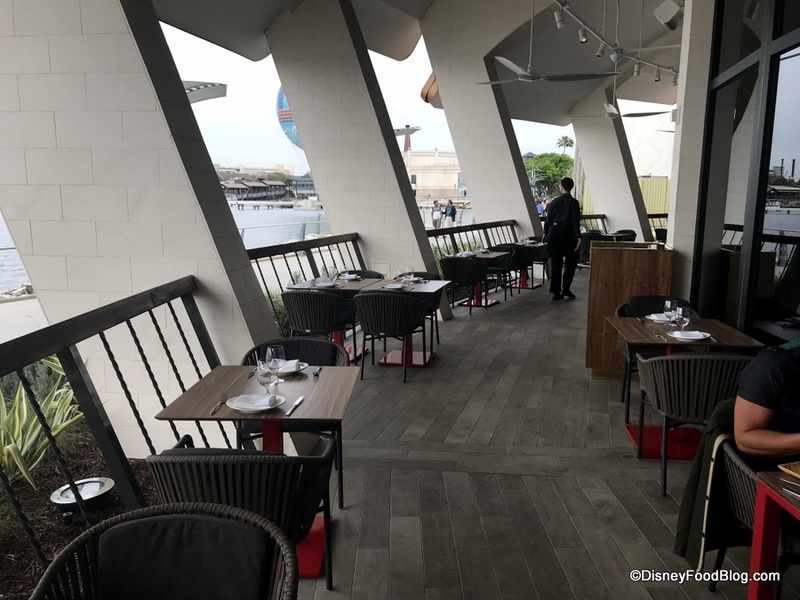 My concern is that this is going to require a lot of time for the servers to explain the differences to patrons, with the extra time leading to slow service for everyone. Second issue, prices. A couple cocktails, three plates and a tip could easily top $80. Keep in mind that’s not dinner, that’s cocktails and three small plates. 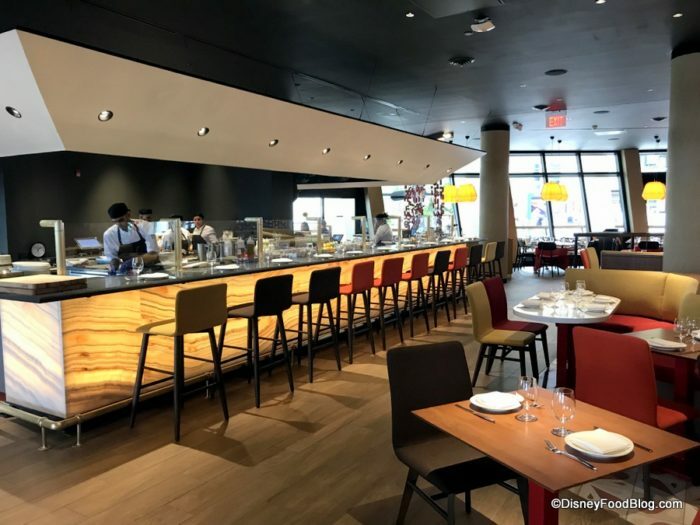 That takes this from a place that we might frequent to a special occasion place (although that’s probably true of a lot of the newer restaurants at Disney Springs). 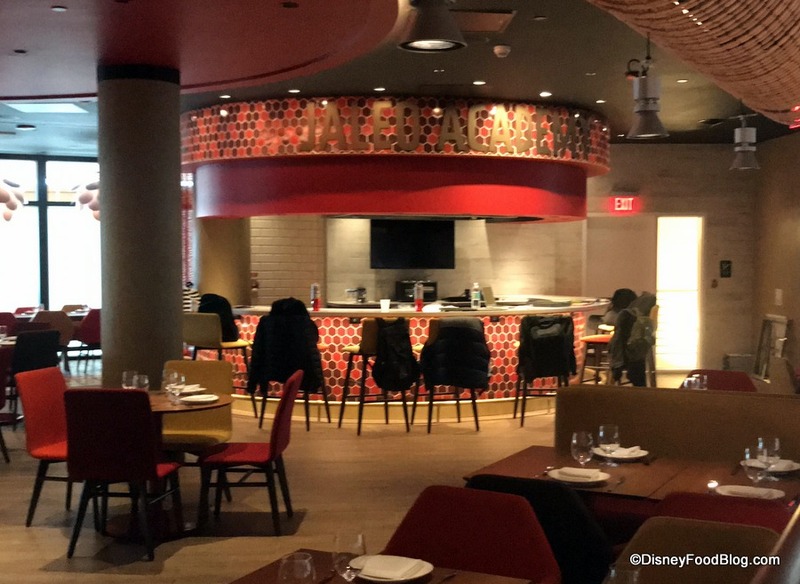 Will still definitely go soon, but more likely will go to the counter service. 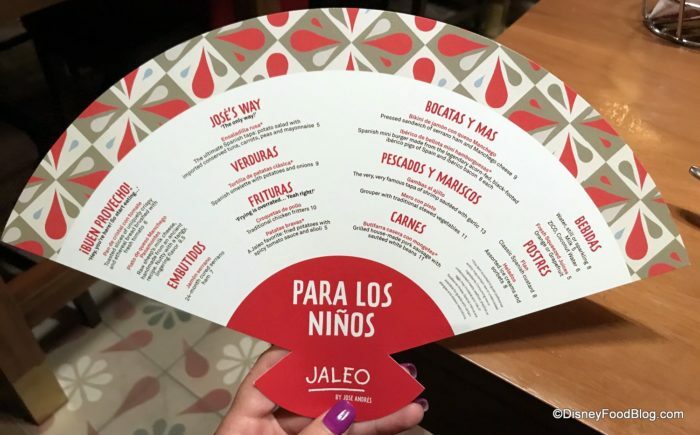 I live near Jaleo and I absolutely adore it. 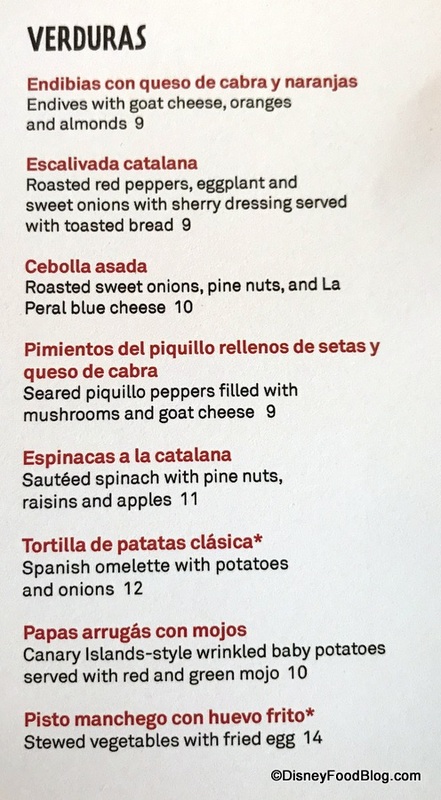 I know the prices are higher, but the quality of the food is outstanding and when I go there will a guest, both of us are usually quite full after 4 plates since these plates are meant to be shared. 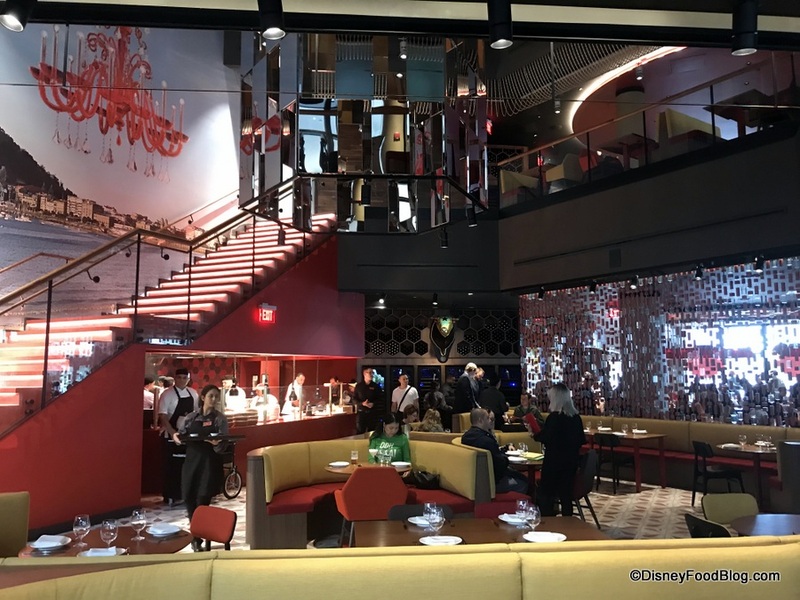 I know some people are concerned about the price, but it is pretty even with other Signature Disney restaurants and to be quite frank, probably higher equality than a number of them. @Jenn. Go to Isabella’s in Frederick. 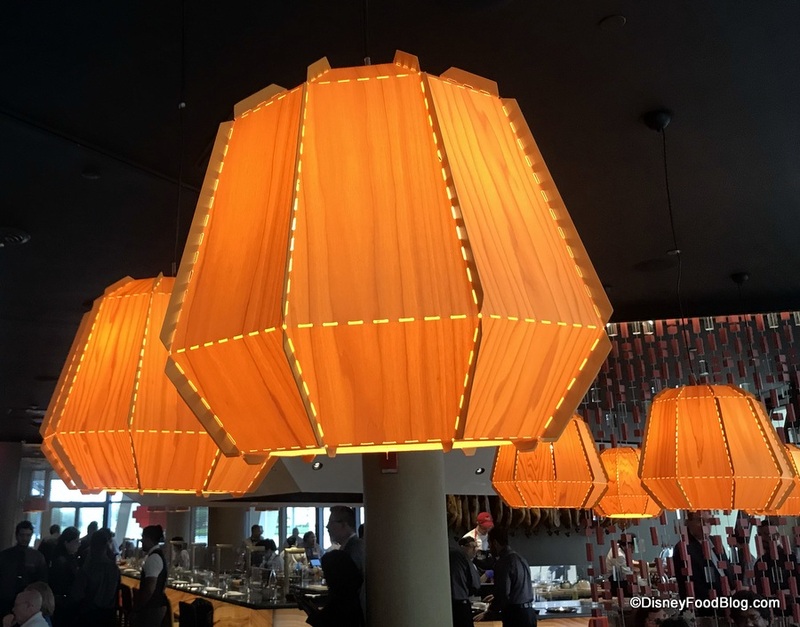 The prices are lower and the food is better. Please be a bit more transparent with prices in your food descriptions. 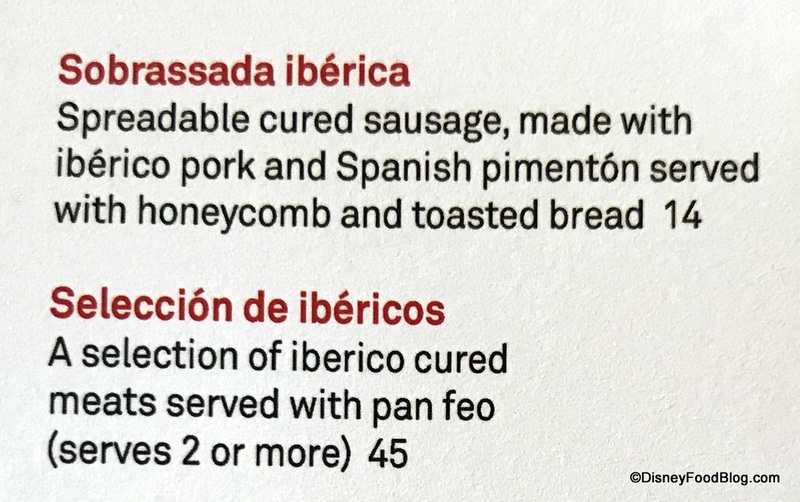 I had to go back and make sure that the tiny portion of jamon iberico you were given was indeed the same thing that was priced at $36 on the menu! Hmm. This is disappointing. 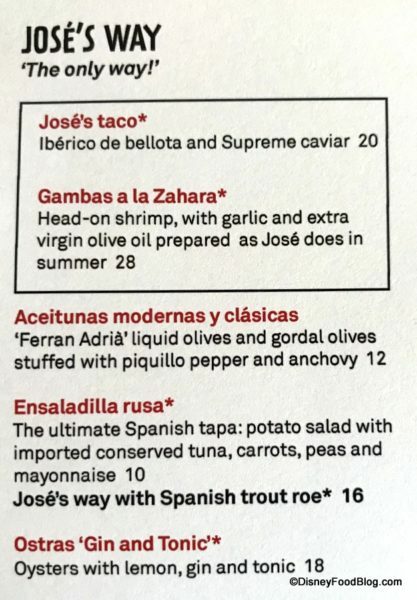 I’m a huge José Andrés fan. 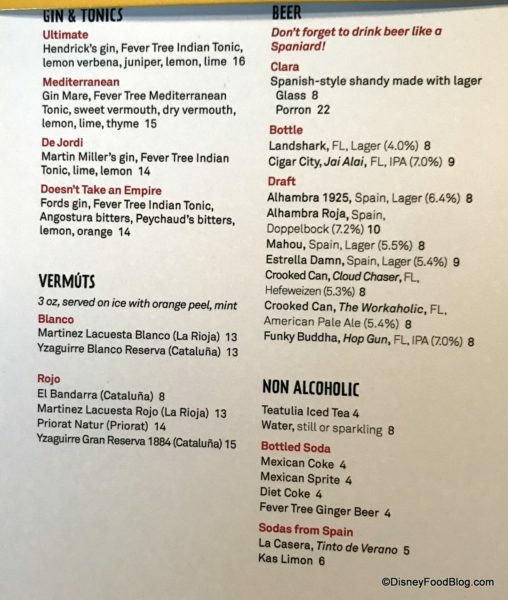 I’ve been to the original (I think) Jaleo in DC (the one in Penn Quarter/Chinatown) as well as to his restaurant in North Beach in Miami. And to the original AmericaEats pop up, which was PHENOMENAL. But I’ve also been to Spain. 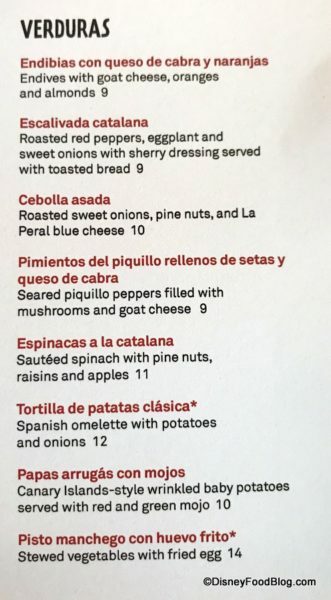 So $11 for pan con tomate hurts me. It physically hurts me. And yes, I get that it’s Disney. And yes, the iberico is only $30, not the I-think-$50 we paid in Miami. 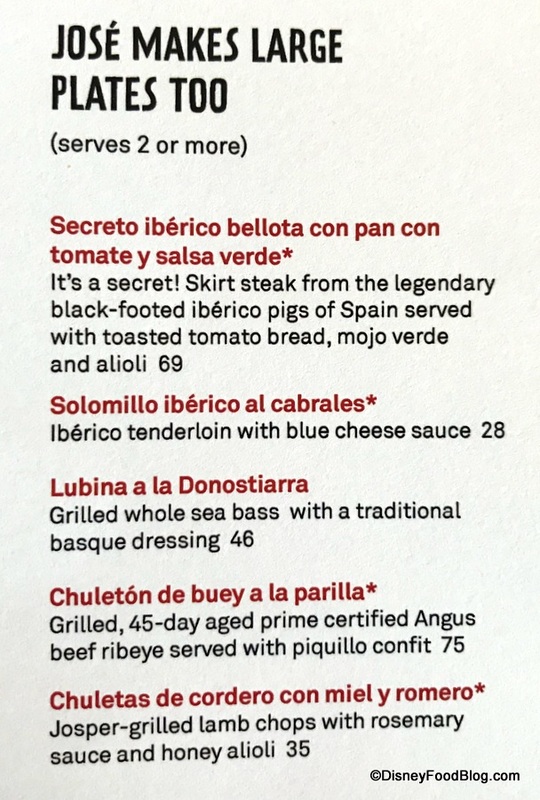 But iberico isn’t as good here as it is in Spain. Not sure why. And do not even get me started on the shrimp. 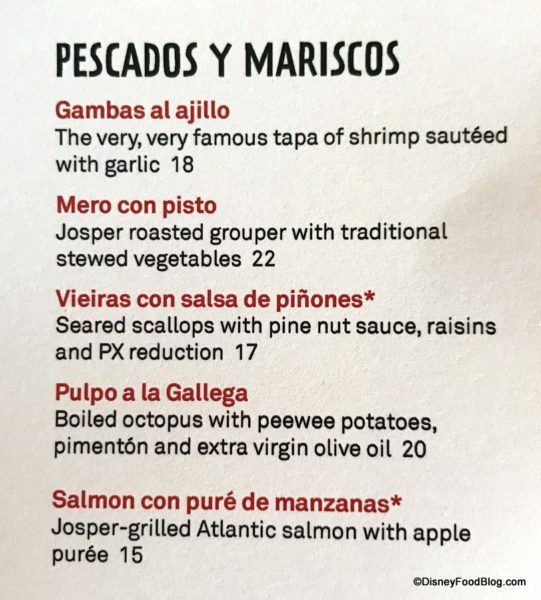 They are naked, headless cocktail-looking shrimp. No. That’s not what this food should be. Hi. I’m a huge food snob. 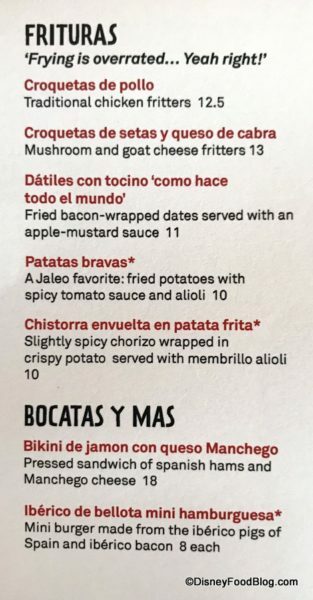 Will I try this Jaleo location? Of course I will. I’ll just go in with lowered expectations. 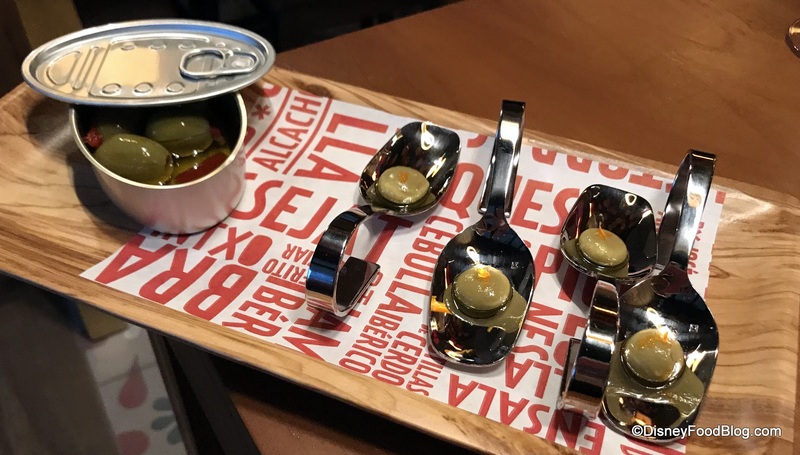 Oh and I’ll for sure order the olive orbs, because those were great at America Eats. I am interested in the Jaleo Academy bar area. 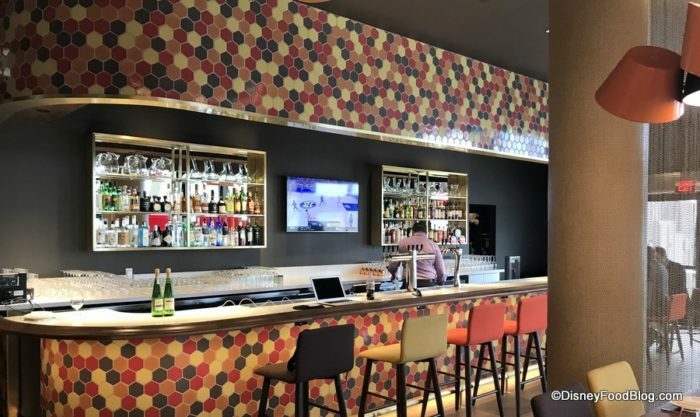 It looks a lot like Minibar. I wonder if they will offer a similar experience. 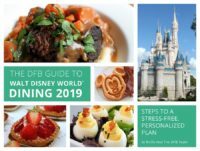 Are there any details on how the dining plan, and specifically deluxe dining will work here. 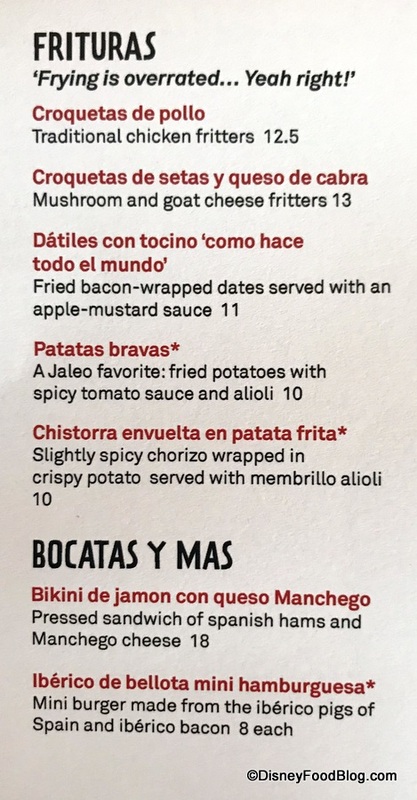 For a place with a tapas focus it could be tricky to get a full meal with an app and entree. 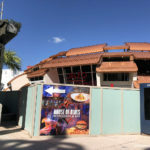 Guinness, we know Jaleo will be a two-credit DDP restaurant, but I’ll see if we can get clarification on what is included. Guinness, be watching for a post on this! 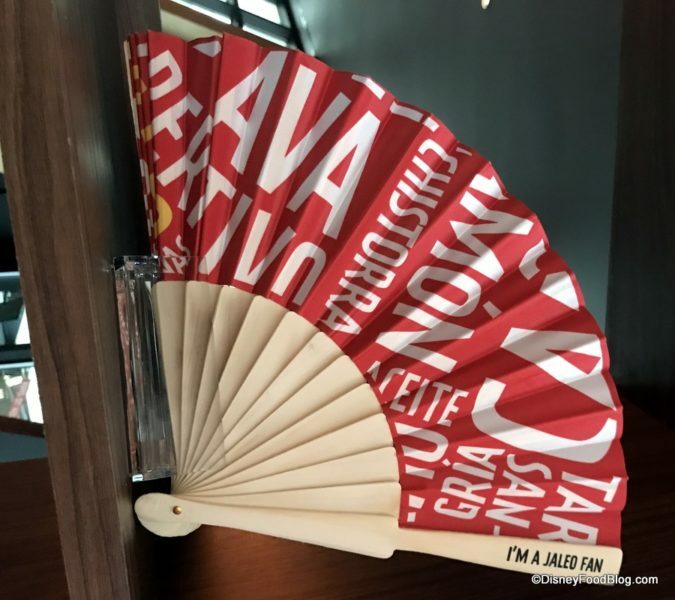 We got some good intel on what the DDP includes at Jaleo, but it’s complicated. Post forthcoming! Thanks! I appreciate your efforts on my behalf! 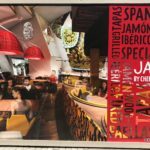 This was my first visit to Jaleo and I am from Spain. I almost walked out of the restaurant and ate at Blaze pizza. First off, the server, Mairamontia, didn’t have any direction in what she was saying. 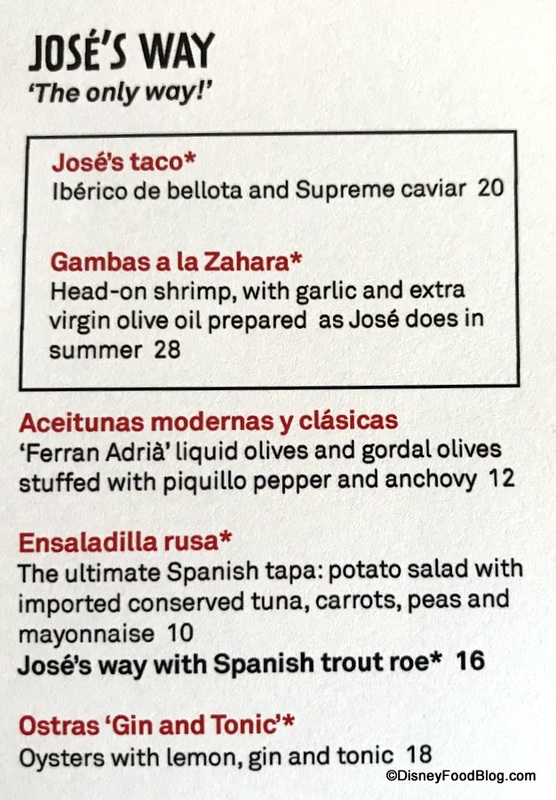 I get she was trying to say that here at Jaleo we dine and it’s all about the company but I didn’t feel that way. It took her a very long time to say anything. She was also very pushy on trying to get us to order drinks that wasn’t water. Like lady I like my H2O and respect that. Second off, the food came at different times. It’s like we took turns on watching each other eating our dinner. That’s awkward.. Why can’t the food be brought up together like a normal restaurant? 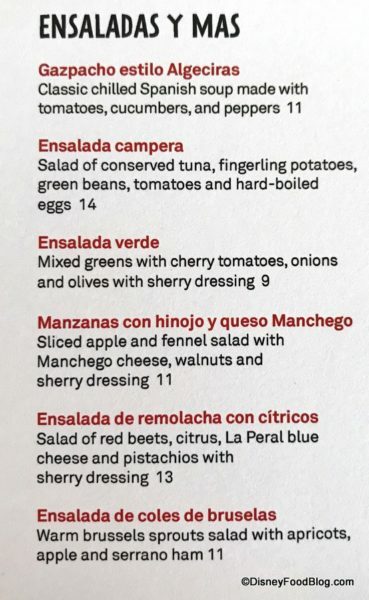 In Spain, all of the food comes out at the same time and in bigger portions and better pricing that I will add. Thirdly, why ask me how I like my steak if it comes out opposite from what I ordered. 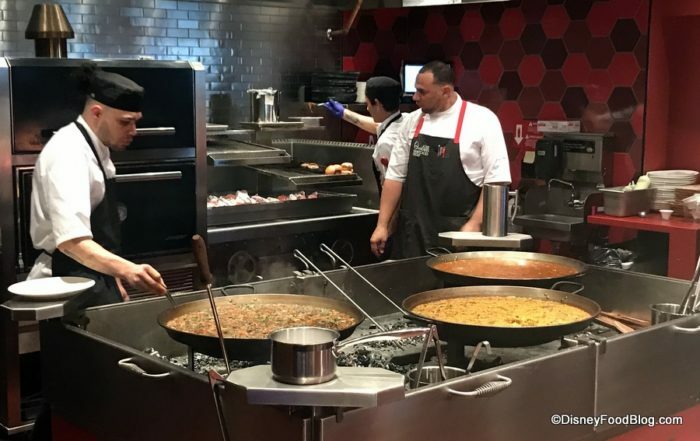 The server blamed the cooks and sweared that she put medium to well done. I don’t need to know the drama even if it was your fault. The steak were so raw it was still moo-ing to say the least. I can’t eat raw food because it will hurt my stomach and I would be out of work for a few days. It took them such a long time to bring back another order of medium to well done steaks that I was so tempted to walk out. The manager brought me the medium to well done steaks and asked me how it looked. Then I said I was missing the side of potatoes I ordered. I also asked for a side of potatoes because just two roasted peppers and 4 pieces of steak wasn’t enough proportion. Thankfully they did not charge me for my plate. Even my parents lamb chops were so rare they sent the meat back. Speaking about the lamb chops, the menu says it feeds 2 or more people when there were only 4 lamb chops. Nothing more. 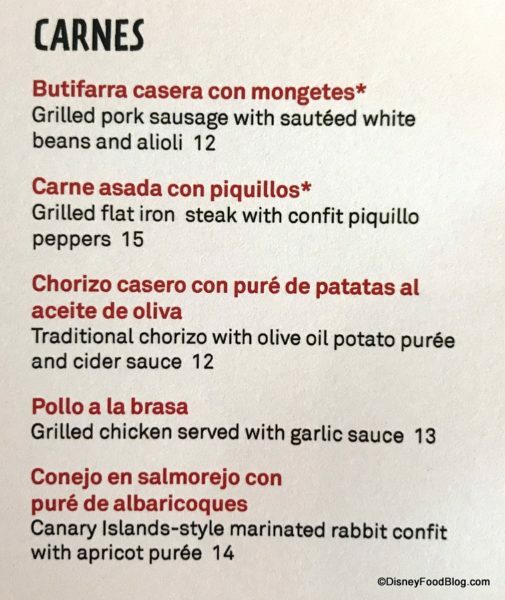 $40 for 4 lamb chops is a bit much. Like I said, for that I would prefer to eat at Blaze pizza. 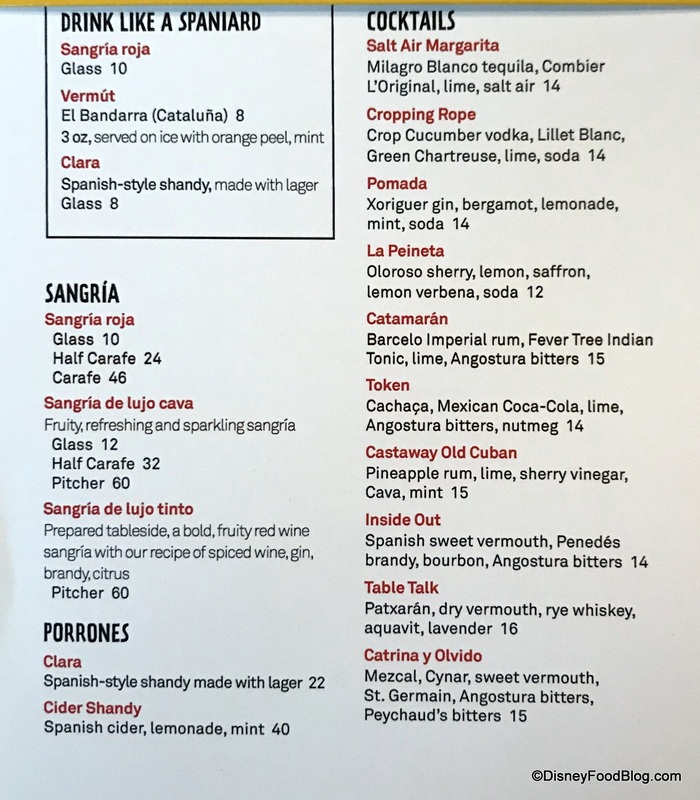 The only thing I really enjoyed was the outdoor food and beverage next to Jaleo was Pepe and it was so much better. The Leche Merengada was delicious! It tasted like the ones I eat in the summer in Spain. 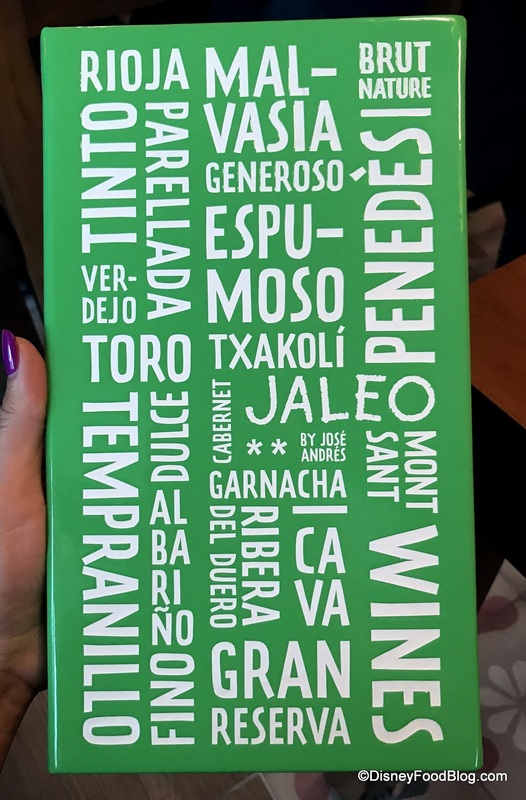 My family and I were not impressed with Jaleo. Something I was looking forward to. 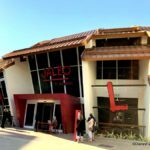 If you want a good portion, good prices, and amazing service, don’t go to Jaleo. Just go to Blaze pizza where you pay $10 for a whole pizza and you can put whatever you want on it and even take some home for left overs unlike at Jaleo. Then after eat the leche merengada for dessert at Pepe. 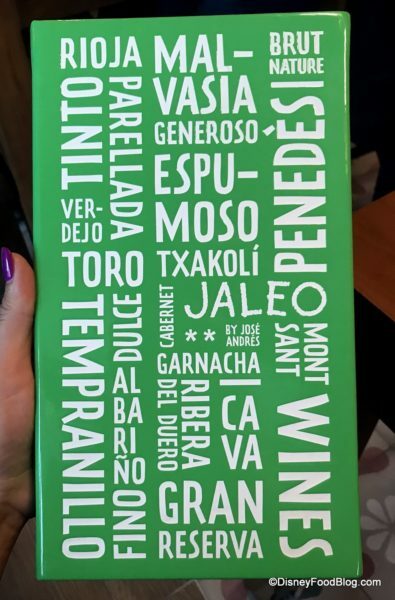 Jaleo wasn’t the best representation of Spain.